An honest, hard-working rover from the famous Western District club South Warrnambool, Terry Board played his first game for the Navy Blues round 1, 1965, against Hawthorn at Glenferrie Oval. That achievement however, was completely overshadowed by the parallel debut that day of ex-Melbourne champion Ron Barassi, who had sensationally been appointed captain-coach of Carlton during the off-season. On that pivotal Saturday afternoon, a record crowd of 36,000 packed into the Hawks’ headquarters, and saw a disciplined Carlton side come out on top by six goals, with Board more than handy in the role of second rover. Working in tandem with Adrian Gallagher, Terry kicked two majors, and gave every indication that he would be a handy acquisition. From then on, he went on to tally up 16 games and 20 goals for the year, and his future looked bright. But the second-year tremors struck in ’66, restricting him to only five senior matches, and a four-week suspension - incurred against Richmond in round 12, for striking his opponent Peter Hogan - didn’t help his cause. By the time Carlton returned to finals action in 1967, Board had been displaced from the senior team by Dennis Munari, who partnered ‘Gags’ Gallagher throughout the Blues’ barren finals campaign of straight sets losses to Richmond and Geelong. In 1968, Board seemed to be back to near his best when he made Carlton’s starting line-up for five successive games between rounds 4 and 8, only to be omitted again until late the season. He played again in rounds 17 and 18, then saw out the year with the Reserves while Carlton went on to edge out Essendon by 3 points in a tense Grand Final, to claim our club’s ninth VFL Premiership. A few weeks later, Board received the dreaded news that his services were no longer required, and so ended his career at Princes Park on 41 games and 42 goals. He wore guernsey number 24 throughout his stay. Shortly after parting with the Blues, Board was appointed playing coach of the North Gambier Tigers in the Western Border League. In 1976, his eldest son Jim was recruited by Collingwood, and went on to play 7 games and boot 5 goals in his single season in black and white. 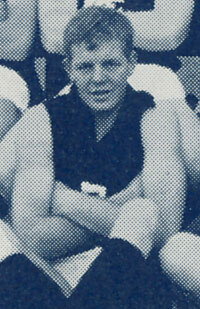 His other son, Terry M. Board, was recruited by Fitzroy in 1988. In an interrupted four-year stay with the Lions, Terry jnr. managed 15 senior games and kicked just the one major. Contributors to this page: Jarusa , Bombasheldon , PatsFitztrick , molsey , tmd1 , keogh , true_blue24 , nikki and admin . Page last modified on Wednesday 24 of May, 2017 15:05:39 AEST by Jarusa. 1990 - Reserves GF; Blues Blitz. 1973 Rd 1 - Brent Crosswell.